I can remember leaving the hospital for the first time with Blake when he was 3 days old. He was so tiny and so precious and it was so cold outside since he was born in December. As we don't drive ourselves I had my mum and her partner come and pick us up just after 9pm to take us home. 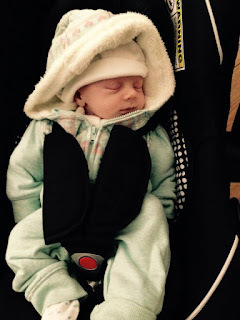 One of the things we made sure when it came to bringing Blake home was that we knew how the car seat was meant to go. On the journey home I was in quite a bit of pain due to have a c-section and was also very emotional and rather scared of what life as a Mum was going to be like. I at one point felt like I was going to have a full on panic attack. Before Blake's arrival one thing I didn't really consider was checking car tyres and getting old ones replaced. As we don't drive this maybe why I never thought about it but its handy to know to do so in the future. Point-s car tyre dealers have a complete range of tyres along with prices available online. It's so important to think about tyre safety when traveling with a young family but with busy family life it's quite often something that you may not think to do. If your like me and my husband and don't drive its still important to check with whoever is driving to make sure that their car tyres are in good condition for the road. After all you precious little cargo is so important and their safety paramount.